The Learning and Performance Institute (LPI) is a global professional association for learning and development (L&D) professionals. 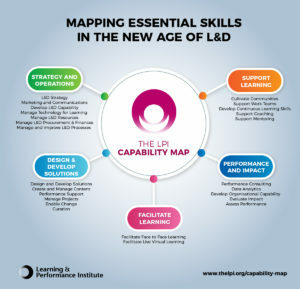 In 2012 they created the LPI L&D Capability Map to provide a global view of the skills needed to deliver modern workplace L&D. Earlier this year I led a project to refresh the LPI Capability Map. (Yes, I need to post about that fabulous experience!) The updated Capability Map was launched in early October 2018. It contains 25 skills across 5 categories as per the image below. I’m now preparing to facilitate my first team capability assessment using the updated Map. It’s a good opportunity to work closely with the LPI to fine-tune the team assessment process. As part of my preparation I completed my self-assessment against the Capability Map today. Anyone can do a self-assessment free of charge by going to this link. There is a fee for the team assessment. 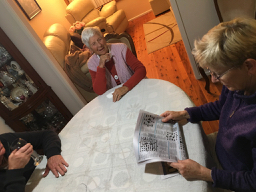 It took me 30 minutes to complete the self-assessment. Recommend you allow 45 minutes. My self-assessment confirmed my gut feel for my key strengths – in the Strategy & Operations and Support Continuous Learning categories. It also validated my high priority gaps. I got value from self-assessing as it clarified my ‘gut feel’ and helped prioritise skills to be developed in next 6 months. L&D skills have expanded in recent years. It’s no wonder that L&D ‘teams of one’ struggle to provide a full, modern learning service in their organisation. Similarly, as an individual I can be selective about which of the gaps in my skill set are important for me to fill and where I will source skills from elsewhere to supplement my own when necessary. I’ve downloaded my personal competency profile from the assessment platform. My next step is to create a simple development plan. Two key priorities for me are Marketing and Communications and Data Analytics. I’ll use resources on Marketing shared by Shannon Tipton on her Learning Rebels website. I am already learning a lot about Marketing working with Karen Moloney on the Learning Uncut podcast. For Data Analytics Trish Uhl, PMP, CPLP is good to follow. I’ll find a short online introductory Data Analytics course and do the next 1-day Data Analytics for Learning Professionals course offered by the Australian Institute of Training and Development. I will also will start doing more with data analytics on current projects – applying skills immediately to consolidate them. When you’ve done the assessment I’d love to hear what you got out of it. You can share below or post on LinkedIn or Twitter and ping me.